Enjoy a night of delicious dining and entertainment inside the Club 60 West Event Center, featuring Todd Oliver & Irving The Talking Dog. As seen on the Today Show, America’s Got Talent and more! Experience a show full of laughter, magic and music while enjoying an incredible meal prepared by Twin Bridges Restaurant. Space is limited for this exclusive show! Purchase your tickets today by clicking here or at the casino cashier. Join us for an Adult Egg Hunt Saturday April 20th. We will have cash prizes, awesome gift baskets, and various prizes donated by local businesses. This event has grown each year, and we have a great time so mark your calendars and join in the fun! Don’t forget to be actively playing with your Club Wyandotte card for a chance to win $100 FREE PLAY and a Garden Tool Set with Hot Seat drawings every 15 minutes! Must have a valid photo ID to claim prizes. Other rules and restrictions apply. Visit riverbendcasino.com for complete details. Date: Tuesday January 1, 2019	through Tuesday December 31, 2019. Date: Event occurs every Sunday of every month. Do you enjoy listening to Blue Grass music? Did you know in the Grand Lake Ok area, you can join Blue Grass Jam Sessions every Monday evening? So, what are you waiting for? 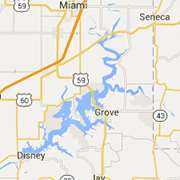 Come and join the community on Monday nights at 555 East 3rd Street, in Grove Oklahoma. The music event takes place at the St. Andrew’s Episcopal Church. This family-centered event is a great way to get to know others in the community. Date: Event occurs every Tuesday of every month. Date: Event occurs every Wednesday of every month.